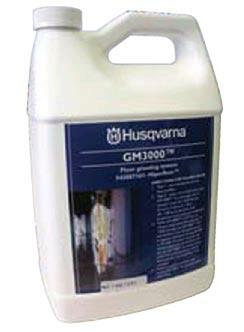 Husqvarna GM3000 is the first product added in the HiperFloor concrete polishing system. It is a latex based grouting mixture that is mechanically worked into the concrete surface to fill in pre-existing defects. These defects are found in the form of pin-hole sized air pockets and absent stone fragments. It is used early in the grinding/polishing process to greatly increase the aesthetics of the finished product before fine grinding and applying the Hyperhard finish materiel. Approximate coverage is 200 sq.ft. per gal. * Please call us for any questions on our concrete polishing grout 1 gal gm3000 h rentals in Portland OR, Gresham OR, Milwaukee OR, and surrounding metro area.